Air plants and crystals are natural creations that display beautifully together. This fun DIY project is perfect for activity to do with children or Friends! The end result? Three lovely handmade modern Home Decor accents gauranteed to make you smile and bring a happy feeling to your heart! ► 3 Tillandsia Air plants / Size: 2-3"
► 1 Rose Quartz Raw Chunk from Madagascar - Size: 2"
► 1 White Quartz Geode from Morocco - Size 2"
► 1 Amethyst Cluster from Uruguay – Size: 2"-3"
*Please expect some slight variation in terms of shape, as each crystal is a natural creation unique in character. specially adapted leaves absorb water and nutrients from the air, allowing them to live anywhere in nature, including suspended from treetops and bare rock. Found in South America and the southern United States, air plants have an amazing variety of shapes, colors, and sizes! PERFECT GIFT IDEA! - Comes packaged in a gift ready box, with care instructions. EASY TO CARE FOR - Air plants only require watering once a week and do not require soil! FAST SHIPPING!! 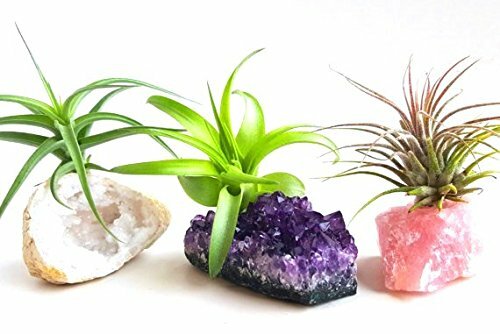 - Aura Creations air plants ship within 24hrs from our Greenhouse to you. NOT a fulfillment center or warehouse. If you have any questions about this product by Aura Creations, contact us by completing and submitting the form below. If you are looking for a specif part number, please include it with your message.